When many travelers start dreaming of using their points and miles, images of the most luxurious airline seats and resorts often come to mind. However, this imagery can also be incredibly overwhelming as well: with so many choices, many travelers may quickly get overrun with all of the options available to them. As the time comes to plan a trip, how can everyone get the most value from points earned through credit cards, flying, and staying at hotels? Using a little research and understanding goals, everyone can use points and miles to see the world in luxury. From our research, these are just some of the most valuable points redemptions you can make for only the best travel experiences. In the United States, the best airline experiences are available on popular transcontinental routes. 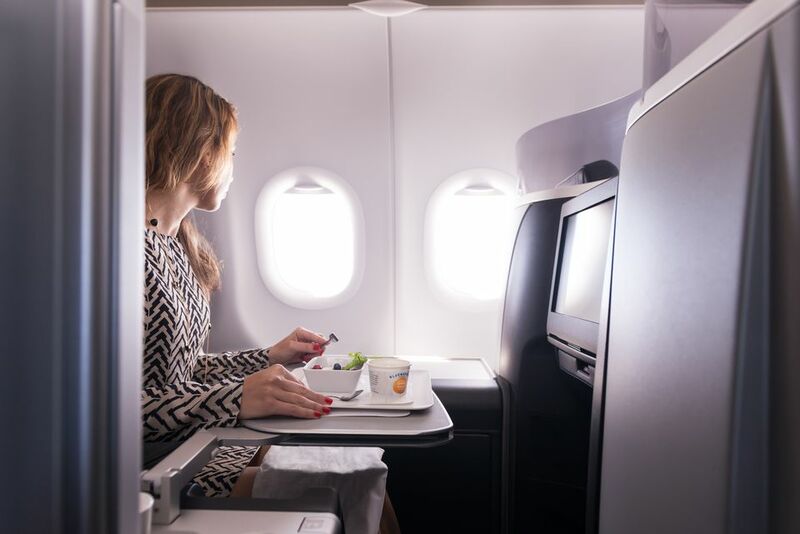 Flights originating from one coast direct to the other often offer top first class cabins, complete with premium lay-flat seating and upgraded food options. Some of the top-rated products include the United Polaris business class and JetBlue Mint. Both of these airline products are available to book with points and miles, often at an incredible value. Seats aboard transcontinental United Polaris flights can cost over $1,000 each way. Instead, United Polaris flights can be booked for as low as 40,000 United MileagePlus miles one way. Aboard JetBlue, awards are tied to the price of airfare, but JetBlue TrueBlue points average out at a value of 1.5 cents per mile. Depending on the flight, around 40,000 TrueBlue points could purchase a ticket in this premium cabin product. Another option for domestic travel is American Airline’s premium three-cabin service aboard the Airbus A321T. Although service is limited to a number of routes, including the New York-Los Angeles run, business class flights can be booked for 32,500 American AAdvantage points one way, or 50,000 points for first class. When it comes to international trips, travelers have more options than ever for premium travel. Although nearly every airline offers some form of first class product, some offer more luxury than others. Perhaps the most valuable international airline points redemption comes aboard Etihad Airways’ luxury products, The Residence and The Apartment. While the three-room Residence is bookable for over two million Etihad Guest miles or prices upwards of $20,000, The Apartment can be booked with ANA Mileage Club Miles or American AAdvantage miles. For 115,000 AAdvantage miles or 97,5000 Mileage Club miles, you can experience one of the best products flying in the skies today. Another choice of premium flyers is Singapore Airlines’ international first class product, the Singapore Suites. As a Star Alliance partner, Singapore Suites can be booked using several mileage programs, including Air Canada Aeroplan miles, Singapore Airlines’ KrisMIles, and United MileagePlus miles. The Most Valuable Hotel Points Redemptions in the U.S.
America has no shortage of luxury hotel rooms, and many of them are accessible using hotel points. The choice of wealthy travelers for years, Ritz-Carlton Hotels rooms may be some of the most accessible for those who only want the very best in their stays. Ritz-Carlton hotels and resorts can be booked using Marriott Rewards points, or by transferring Starwood Preferred Guest Starpoints to Marriott Rewards at a 1:3 ratio. Tier Two award certificates start at 30,000 Marriott Rewards points per night, with the option to get a fifth night free when booking four consecutive nights. Tier Two Ritz-Carlton properties in the United States include The Ritz-Carlton, Dove Mountain in Arizona, The Ritz-Carlton Orlando, Grande Lakes in Florida, and The Ritz-Carlton New York, Westchester. Noted for its wealth of culture and history, Europe offers no shortage of luxury redemption options for travelers. Perhaps the best kept secret is the independent group of hotels collected under the Preferred Hotels and Resorts. While the iPrefer rewards program allows travelers to redeem their points for gift certificates, the group also has an alliance with an unlikely partner: Choice Hotels. Through the arrangement, travelers can redeem Choice Privileges points for stays at Preferred Hotels. One of our favorite destinations, The Pulitzer Amsterdam, can be booked for just 40,000 Choice Privileges points per night, which can be earned through spending in the first year of holding the no annual fee Choice Privileges Visa Signature card. Across Asia, travelers have many options on how to use their points. Some of the most valuable hotel points redemptions comes from the ocean-side resorts found in Bali, Indonesia and Phuket, Thailand. Hilton Hotels offers some of the most accessible resorts in Asia, offering plenty of value for Hilton Honors points. The Conrad Bali offers suites with a view of the ocean or private pools, with points redemptions available for as low as 60,000 Hilton Honors points. In Thailand, the Hilton Phuket Arcadia Resort and Spa offers a room with an ocean view, and can be booked for as low as 25,000 Hilton Honors points. While Africa is one of the most diverse continents in the world, luxury travelers often flock to the Seychelles for a breathtaking getaway. Lucky for points and miles travelers, this island nation is also very accessible with points and miles options for all. Once again, Hilton Honors offers many different options for those seeking a luxurious island getaway, while saving hundreds of dollars per night. With three different resorts on the island—The DoubleTree by Hilton Seychelles Allamanda Resort & Spa, the Hilton Labriz Resort & Spa, and the Hilton Seychelles Northolme Resort & Spa—those wishing for a frugal getaway have plenty of options on points. While pricing may vary based on demand, the cheapest time to use points is during the low season, between February and May every year. Travelers across the "land down under" have plenty of choices for their next adventure. In the posh capital of Sydney, no hotel bookable on points may be better than the Park Hyatt Sydney. While rates for this hotel can go for over $800 per night during the summer months (November-April), booking this hotel with World of Hyatt points can represent a valuable points redemption. At just 30,000 World of Hyatt points per night, travelers can save a lot of money on their room, leaving them free to take in the culture of this international city. Other high-end Hyatt hotels are also available in Perth and Melbourne, as well as Auckland, New Zealand, offering plenty of options across the continent.